About 20 years ago I acquired a lightly gold washed dessert set in the Tiffany Vine pattern. After I got it home I examined it closely and noticed that five of the individual place pieces had a strange mark added to the reverse of the bowls. 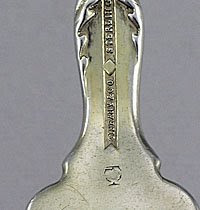 It turned out to be the Columbian Expo mark from 1893 indicating that these pieces were on display in Chicago in the Tiffany pavilion. A few weeks ago the same thing happened. 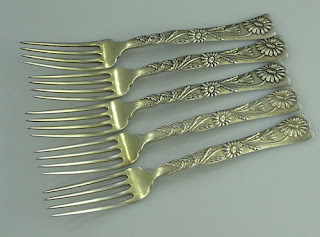 I purchased 11 forks in the Tiffany Vine pattern with that same gold wash. 5 of the forks are struck with that special mark. These pieces were all part of the same set. About 3 years ago the Flagler museum in Florida held an exhibit of Tiffany silver exhibited at the Columbian Expo and I went to see the exhibit. I bought a book about the Columbian Expo pieces made by Tiffany and read at the back that Tiffany made sent 118 pieces of Vine to the exhibit.